CHICAGO (February 8, 2018) – The Windy City has always been the Mazda MX-5 Miata’s second home, serving as the launch pad for its world debut at the 1989 Chicago Auto Show and the site of numerous MX-5 “firsts.” This year, it’s where Mazda announces pricing and packaging for the 2018 Mazda MX-5 Miata RF, or retractable fastback. The MX-5 RF complements Mazda’s sports car lineup with classic coupe proportions that elevate both its cache and curb appeal. Entering into its second model year, the award-winning MX-5 RF receives some notable upgrades, including newly standard heated cloth sport seats in MX-5 Club models, standard Advanced Keyless Entry on all models, new color options and heated leather-trimmed seats in MX-5 RF Club’s Brembo/BBS Package. Both MX-5 Club and MX-5 Grand Touring models come well-appointed with standard LED headlights, MAZDA CONNECTTM infotainment technologies with a 7-inch display, two USB inputs for connectivity and phone charging, Bluetooth, BOSE® Premium 9-speaker audio system, SiriusXM satellite radio with a 4-month trial subscription, Advanced Blind Spot Monitoring with Rear Cross-Traffic Alert and a leather steering wheel and shifter knob, among many other features. The 2018 MX-5 RF Club, when equipped with a 6-speed SKYACTIV-MT manual transmission, features a limited-slip rear differential, a front shock-tower brace and Bilstein dampers. 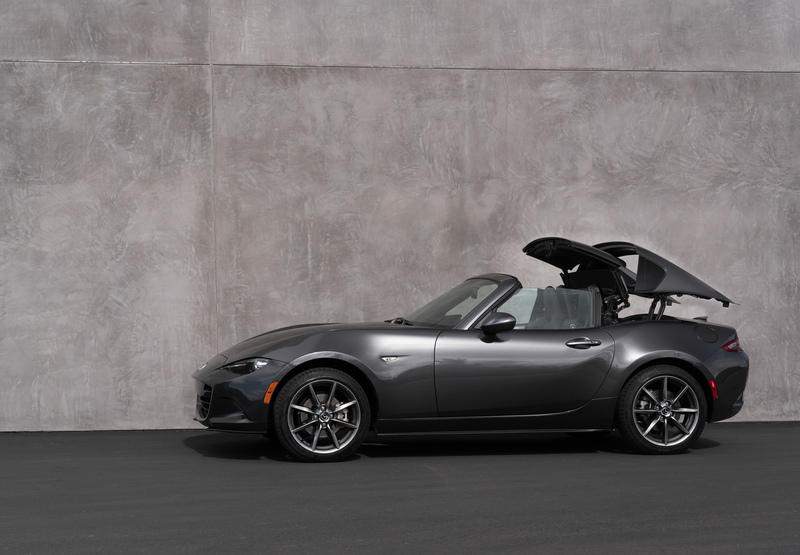 All MX-5 RF Club models come standard with 17-inch dark alloy wheels, piano black exterior mirror caps, front air dam and rear spoiler extensions and red seat stitching. The available Brembo/BBS package includes forged, lightweight BBS wheels; body sill extensions; a rear bumper skirt; and heated black, leather-trimmed sport seats. The more luxurious MX-5 Grand Touring is equipped with body-color exterior mirrors, automatic on/off headlights, rain-sensing windshield wipers, automatic climate control, heated leather seats, navigation, Adaptive Front-lighting System, High Beam Control and Lane-Departure Warning System. Newly available for 2018 is Auburn Nappa leather, which was previously only available in the U.S. in MX-5 RF Launch Edition models. All MX-5s come powered by a quick-revving SKYACTIV-G 2.0-liter engine, sending up to 155 horsepower to the rear wheels via a standard 6-speed SKYACTIV-MT manual transmission or 6-speed automatic. New color options include Eternal Blue Mica, which replaces Blue Reflex Mica; Snowflake White Pearl Mica, which replaces Crystal White Pearl Mica; and Soul Red Crystal, which replaces Soul Red Metallic. The 2018 MX-5 RF goes on sale this month nationwide, joining its 2018 MX-5 soft top sibling that went on sale in December. MSRP does not include $890 for destination and handling ($935 Alaska), taxes, title or additional fees. Dealers set actual sale prices.